Airfree Tires Wear Well, Won't Go Flat, Ride Like Pneumatic, and Parents Love Them! Airless tires. Until only recently tires came with tubes which required checking for proper pressure of 85 psi. Most scooters still use pneumatic tires. They have several drawbacks: the parent must insure the tire is pressurized properly or else the innertube will move inside the tire and cause the valve stem to be cut, requiring the replacement of the inner tube. This can be a difficult job that only a qualified adult can accomplish. The tube can also be punctured through the tire by a foreign object and result in a flat. Through testing and trials we have now provided an airless or airfree tire that uses a composite material to replace the inner tube. The tire still rides like an pneumatic tire but cannot suffer innertube failure since there is no innertube. It can never be punctured or rotate when properly installed on the correct size rim. The feel of the airless tire is the same as having an inflated tire, yet it can never go flat and require adult supervision or need for replacement caused by lack of air pressure. 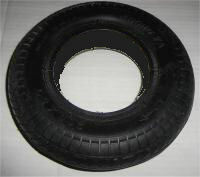 It is a high quality tire, not plastic or cheap material. We provide these tires in the three primary sizes used on today's scooters: 8" by 2" or metric 200 x 50 mm, 8.5" by 2", and 10 inch or 3.00-4 (where the tire is 3 inches wide and mounts on a standard 4 inch wheel rim). All wheel rims are standard 4 inch such that the center hole of the tire is 4 inches in diameter. These airless tire sizes can replace any 800 watt (1 HP) or less electric scooter tire utilizing equivalent size pneumatic tires and tubes. A 30 day Limmited Warranty extends to use of these airless tires on Rad2Go (and 200x50 aireless tires on Vapor or X-treme electric scooters and rims we have tested). We have not had ANY customer returns for warranty in the entire time we have sold airless tires manufactured for Rad2Go scooters since 2001. NOTE: Some gas scooters using the same size tire may be able to utilize airless tires if the rim is made to secure the airless tire from slipping (slipping can cause tire damage) or it is properly secured in place, but powerful gas scooters can damage airless tires just as repeated skidding or high acceleration using over 1 HP motors will cause possible tire slippage that will result in damage and no warranty coverage utilizinag Rad2Go's warranty. Order them on our AIRLESS TIRE page. When you Click the BUY NOW Button you will see the price with Shipping & Handling for the USA (Email for International) added to the item price listed. DISREGARD ANY OTHER PAYPAL SHOPPING CART NOTICES FOR ADDITIONAL SHIPPING! Clicking the ADD TO CART or BUY NOW button to place an order indicates you have read and will abide by the Order Policies as printed on this web site. Price Match Guarantee AND Immediate Fast Shipping of Quality Tested Parts Packaged to Arrive Safely! Information to Consider on Parts, Scooters, & Shopping!